Crown Prince Mohammed bin Salman during a visit to France in 2018. Last year, bin Salman announced plans for a 10,000 square mile-plus city named Neom, saying it would be “drone-friendly and a center for the development of robotics” and “a place for dreamers who want to create something new in the world, something extraordinary.” This year, the crown prince toured Silicon Valley, meeting some of its titans of industry including Google co-founder Sergey Brin and CEO Sundar Pichai, Amazon CEO Jeff Bezos, Microsoft founder Bill Gates and CEO Satya Nadella, and Apple CEO Tim Cook, as well as venture capitalists and executives from other firms. Later, it emerged that Saudi Arabia’s sovereign wealth fund was involved in discussions with Tesla CEO Elon Musk about a possible plan to take the company private (that was never actually agreed upon). Bin Salman was also an aggressive booster of the Saudi Arabian sovereign wealth fund’s $3.5 billion investment in Uber in 2016 and a massive deal with Softbank Group Corp. that is still growing, according to Bloomberg. 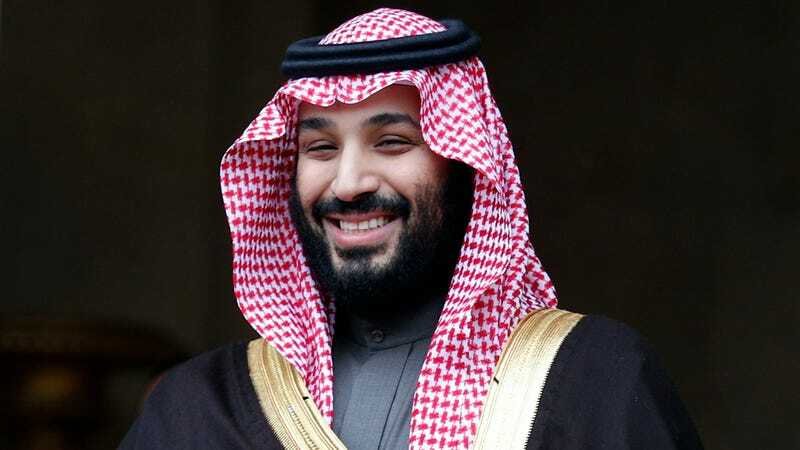 As Recode recently noted, this is all part of a pattern in which “Riyadh is an ascendant, underrated power player in Silicon Valley finance... showing muscle and projecting strength that makes them more and more indistinguishable from Silicon Valley’s other homegrown power players.” This effort is part of bin Salman’s Vision 2030 plan, which more or less entails diversifying the country’s mostly oil-based economy into tech and logistics. Those plans involve investments in sectors like chemicals, plastics, data centers, and high-tech military gear, according to CNBC. The fumbled Tesla deal would have also involved “broader plans to create new industries in solar-power generation, battery storage and electric-vehicle production,” the Wall Street Journal wrote. The crown prince’s political supporters have at times tried to present him as a Silicon Valley-style disruptor. Despite orchestrating the kidnapping of the Lebanese prime minister, waging a brutal war in Yemen and locking up hundreds of prominent Saudis in a luxury hotel on accusations of corruption, the prince has won Western supporters, including the government of the United States, that have embraced his economic policies and limited social reforms. But Mr. Khashoggi’s death in Turkey — if confirmed — could change all that. It would likely be widely viewed as a brazen violation of international norms and a grave escalation of what critics have called reckless and ruthless efforts by the prince to consolidate power and stamp out dissent at home and abroad. In other columns, Khashoggi denounced bin Salman’s repression of dissent, saying all that could be seen of the crown prince’s promised reforms was “the recent wave of arrests,” and also was critical of the brutal Saudi war in Yemen and its one-sided crackdown on extremism. In another, he wrote that bin Salman “did the right thing for Saudi Arabia” by ending a ban on women drivers—reportedly an important factor in Uber’s relationship with the kingdom—but added that the prince should release women activists arrested for criticizing the government. In other words, much of the work that may have put Khashoggi in danger touched upon bin Salman’s efforts to pitch Saudi Arabia as a reforming nation ready to be at the forefront of innovation. It’s not clear whether those efforts would have ever worked. As the Middle East Eye noted earlier this year, there are significant obstacles between the Vision 2030 plan and current reality, including a private workforce heavily reliant on imported labor, the lack of underlying infrastructure and commerce that is not dependent on oil subsidies, and prohibitions against freedom of speech that could turn off social media giants and advertisers. If Turkish authorities publicly provide evidence that Khashoggi was indeed killed, those plans could become even more difficult to pull off.